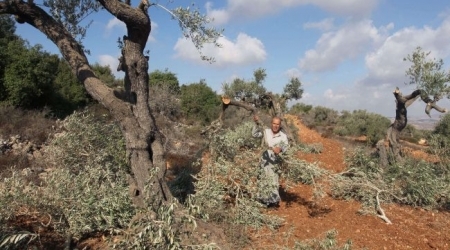 The Israeli occupation forces (IOF) on Friday morning stormed Madama village to the south of Nablus city and embarked on uprooting and destroying olive trees in Palestinian-owned fields. Eyewitnesses reported that a large number of Israeli military vehicles stopped near the bypass in the western side of the village as troops were cutting and removing olive trees. Israeli soldiers on Thursday had put up a military notice written in Hebrew on one of the trees warning the landowners of their intention to uproot the olive trees in their fields. 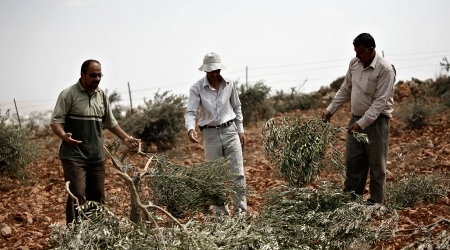 The villagers condemned the Israeli military decision to remove their olive trees as arbitrary and unfair, saying it was taken without giving them a chance to take legal action against it. 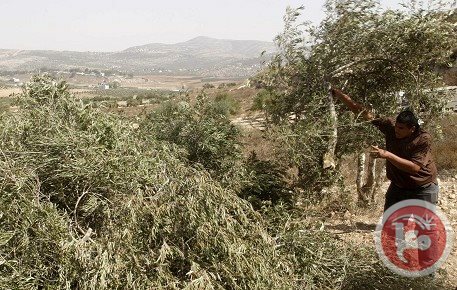 The Israeli Army decided to cut and uproot hundreds of Palestinian trees, near a bypass road used by Israeli settlers, close to Madama village, south of the northern West Bank city of Nablus. Palestinian official, Ghassan Daghlas, in charge of Israeli settlements file in the northern part of the West Bank, said the army has officially informed the residents of its intention to uproot all trees planted on both sides of the Yitzhar-Madama road. Daghlas added that the army already marked the trees that would be removed, and already uprooted more than 52 olive trees overnight. It is worth mentioning that Israel has uprooted more than 800.000 olive trees since it illegally occupied the West Bank, the Gaza Strip and East Jerusalem in 1967. To mark the occasion of Land Day, one thousand olive saplings were planted on Palestinian land threatened with seizure by Israel in ‘Arraba, near Jenin, on Monday. The saplings were jointly planted by the Palestinian Agricultural relief Committees (PARC) and ‘Arraba Municipality, in lands adjacent to Mabo Dothan settlement, WAFA reports. 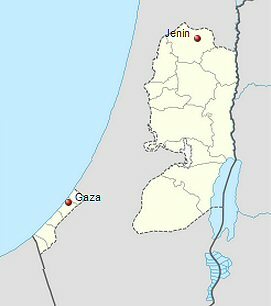 Assistant Governor of Jenin, Kamal Abu al-Rub called for organizing more peaceful popular activities to confront settlement and land seizure, denouncing Israeli policies of building the expansionist apartheid wall in Yaʻbad and ‘Arraba. Mayor ‘Arraba Rula al-Shaʻer underscored the importance of drawing up a national program for the purpose of reinforcing the Palestinians’ steadfastness, particularly in areas threatened with settlement expansion. Coordinator of PARC Mohammad Jaradat stated that his association recruited two lawyers who would provide Palestinian farmers with the legal assistance required to protect their lands against being seized by Israeli settlers. In Gaza, Israeli Forces, stationed at the borders of the Strip, Monday, opened fire on a group of Palestinian youngsters as they raised the Palestinian flag on the borders to the east of Khan Yunes, marking Land Day, according to WAFA correspondent. He said that a number of youth climbed the separation wall and raised the Palestinian flag, marking the day. 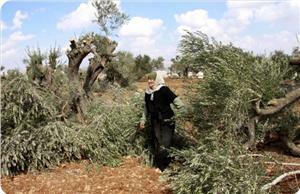 Dozens of Palestinians also organized an activity to mark the day by planting olive trees near the borders. Meanwhile, Israeli soldiers stationed at military towers along the borders opened live fire on the youth and launched tear gas canisters towards them, resulting in several suffocation cases. 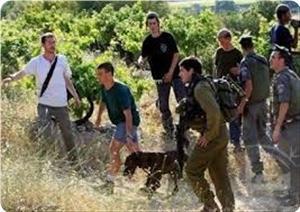 An Israeli military spokeswoman told Ma'an that the Palestinians in the area were "tampering with the security fence." "Soldiers opened fire into the air" and the Palestinians dispersed, she said. Land Day marks the death of six Palestinian citizens of Israel, who took part in a general strike in protest of an Israeli decision to confiscate privately owned Palestinian lands on March 30, 1976. Israeli forces frequently shoot at farmers and other civilians inside the Gaza Strip if they approach large swathes of land near the border that the military has deemed off-limits to Palestinians. According to OCHA, 17 percent of Gaza's total land area and 35 percent of its agricultural land were within the buffer zone as of 2010, directly affecting the lives and livelihoods of more than 100,000 Gazans. 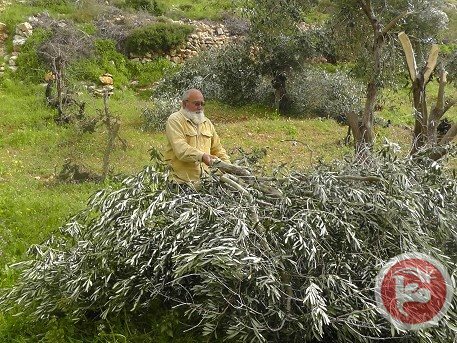 A number of Israeli settlers invaded a Palestinian olive orchard in Husan town, west of Bethlehem, and uprooted dozens of saplings. 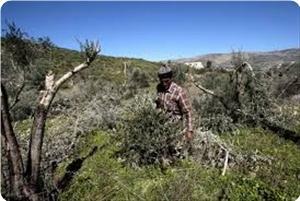 Resident Mohammad Sabateen told the WAFA News Agency that, as he went to his orchard in Wadi Abu al-Hasan area, east of Husan, he found out that the settlers uprooted at least fifty olive saplings. 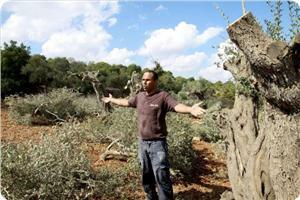 The orchard is located near the illegitimate Boaz settlement outpost, installed on private Palestinian property. Sabateen added that, in February of this year, fanatic settlers invaded his orchard, and uprooted more than 60 olive saplings. Israeli settlers are responsible for hundreds of attacks against Palestinian orchards and farmlands, in addition to flooding Palestinian farmlands with sewage. 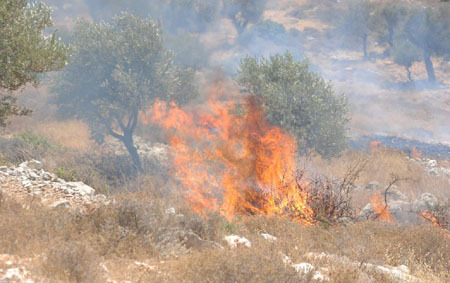 On Wednesday, February 19, 2014, a number of extremist settlers invaded Palestinian olive orchards, north of the central West Bank city of Ramallah, uprooting more than 700 saplings. Other attacks include defacing and burning several mosques and churches, attacking and defacing graves in Islamic and Christian graveyards, burning Palestinian-owned cars, slashing tires and writing racist graffiti, including anti-Islamic and anti-Christian graffiti. 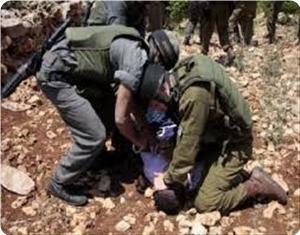 The attacks took place in different parts of occupied Palestine, including occupied Jerusalem. On Saturday evening, settlers attacked Palestinian homes and stores in the southern West Bank city of Hebron, while Israeli soldiers attacked local residents and kidnapped three.